The neverending story if using less and less resource for a process continues: replacing Munin with collectd for system resource memories. 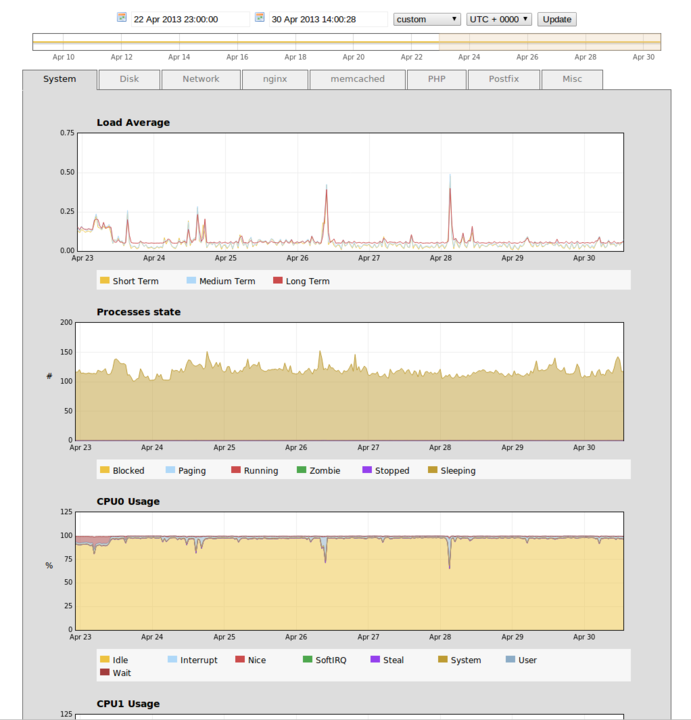 For years I’ve been using Munin1 on my systems for graphs on system resource usage. I’ve just recently discovered PyMunin2, a python based extension that makes munin even more awesome. But as always, I’ve encountered with limitations and problems. First of all, Munin plugins are ugly. They come in various languages, bash, Perl, Python, and so on, they does not share any similarities and sometimes they even have dependencies not mentioned during the install or in the readme. Munin only has 5 minutes resolution - this is OK for some cases, but today’s requirements are changing, and it’s really hard to change. Also, the munin-node is basically periodical: at every 5 minute it runs through the changes and compute the required data which result a small CPU usage spike. So I decided to go for something lighter, that runs as a daemon and does not require hacked plugins to work. The result is: collectd3. In short, it’s probaly the most light-weight, modest and really modular data collector. It does not generate any graphs - that’s done by something else, on-demand. It’s also very portable, suitable for both large scale computing ( could be source for nagios ) and for embedded as well. And it’s fairly easy to configure. The install on Debian-like systems is just the regular apt-get way: sudo apt-get install collectd. Postifx & fail2ban are monitored with the tail plugins of collectd while APC & FPM status is monitored with the curl_json plugin. Regex "<postfix /smtpd[[0-9]+]: connect from>"
Regex "<postfix /smtpd[[0-9]+]: disconnect from>"
Regex "<postfix /smtpd[[0-9]+]: lost connection after . * from>"
Regex "<postfix /smtpd[[0-9]+]: timeout after . * from>"
Regex "<postfix /smtpd[[0-9]+]: setting up TLS connection from>"
Regex "<postfix /smtpd[[0-9]+]: [A-Za-z]+ TLS connection established from>"
Regex "<postfix /smtp[[0-9]+]: setting up TLS connection to>"
Regex "<postfix /smtp[[0-9]+]: [A-Za-z]+ TLS connection established to>"
Regex "&lt;450 4.7.1>. *Helo command rejected: Host not found>"
Regex "&lt;450 4.7.1>. *Client host rejected: No DNS entries for your MTA, HELO and Domain>"
#Regex "&lt;450 4.7.1>. *Client host rejected: Mail appeared to be SPAM or forged>"
Regex ". *Service unavailable; client . * blocked using . *"
// __author__ = "Peter Molnar"
// __copyright__ = "Copyright 2013, Peter Molnar"
* See LICENSE for details. * based on the RRD data available on your system. The outcome: the drop at the load at the beginning of the graph is where the munin-node was turned off.